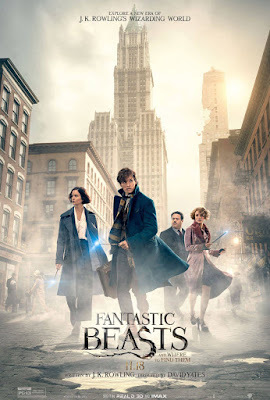 Fantastic Beasts And Where To Find Them is a sort-of prequel to the Harry Potter series, in that it takes place well before HP, but is itself its own story (even if you have never seen or read Harry Potter, you can still enjoy this movie). The first of five films, Fantastic Beasts follows the adventures of Newt Scamander, who arrives in New York City only to discover that some of the creatures he had brought with him have escaped. Meanwhile, there have been some mysterious occurrences throughout the city, putting the Magical Congress of the United States of America on high alert. I went to see this film on Black Friday with a couple of friends. I had heard more good than bad about this movie beforehand (while still managing to stay away from spoilers), and since J.K. Rowling herself had written the script rather than someone else, I was rather excited. So anyway, back to Fantastic Beasts. I felt that Rowling did a fantastic job on the script, and the director and cast did an excellent job on bringing the story to life. Overall, the film was just as witty and enthralling as the HP novels were. I don't want to get into details on the characters or plot, because I feel that the best way to view this film is with as few expectations as possible, but I will say without a doubt that I thoroughly enjoyed this film, and will be buying it as soon as it's released to DVD & Blu-ray. I may actually even go back to see it in theaters again, if I get the chance to. Maybe IMAX this time? At any rate, I cannot wait for the next installment in the series. I'm so excited!